Vanee Turkey Flavored Gravy Mix delivers authentic turkey gravy flavor, texture, and appearance, and is sure to elevate any turkey dish you pair it with. Perfect over turkey, mashed potatoes, pasta, and open-faced sandwiches. 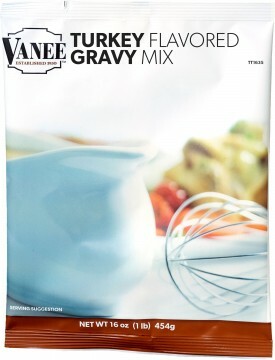 Vanee Turkey Flavored Gravy Mix has no added MSG, superior steam table performance, and is an easy and affordable way to quickly make large volumes of turkey gravy. Each 16 oz. bag makes 65 quarter-cup servings (prepared), for a total of 520 servings per case. Serve over mashed potatoes, roasted turkey, or use as a soup base. Enriched Wheat Flour (Wheat Flour, Niacin, Reduced Iron, Thiamine Mononitrate, Riboflavin, Folic Acid), Food Starch-Modified, Salt, Chicken Fat, Sugar, Dried Sweet Whey, Maltodextrin, Hydrolyzed Corn Protein, Dried Turkey (Cooked Turkey, Natural Flavor), Turkey Broth, Onion Powder, Yeast Extract, Flavor [Maltodextrin, Dried Turkey Meat, Yeast Extract, Flavoring (contains Canola Oil), Torula Yeast, Turkey Fat, Lipolyzed Butter Oil, Ascorbic Acid, Disodium Inosinate, Disodium Guanylate], and less than 1% of the following: Spice, Natural Flavoring, Caramel Color, Disodium Inosinate, Disodium Guanylate, Fructose, Oleoresin Turmeric, Chicken, Beef Stock, Chicken Broth, Sesame Oil, Cheddar Cheese (Cultured Milk, Salt, Enzymes), Sodium Phosphate, Nonfat Dry Milk.